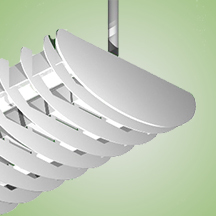 This fixture is designed for suspension mounting for direct/indirect applications where aesthetics and performance are both needed.This fixture is ideal for offices, libraries, schools, etc. Designed to mount on exact 4 foot, 8 foot, and 12 foot centers. Joiners will accept stems, single cable, and power cords as supplied by Horizon. Louvers available in white or semi-spec aluminum. Louvers give a better than 45 degree cutoff to the lamp. Heavy gauge roll formed steel housing with perforated pattern. Aluminum lateral baffles. 120/277 volt, 50/60 Hz. 480/347 volt available upon request. Comes standard with instant start electronic ballast for T8 applications.